Salad bar is a buffet-style counter where salad ingredients are provided for diners to assemble their own salad plates. Popular ingredients include lettuce, cucumbers, carrots, corn, green capsicums, tomatoes, jelly, croutons, shredded cheese, dressed potatoes, macaroni salad and wide selection of salad dressing. 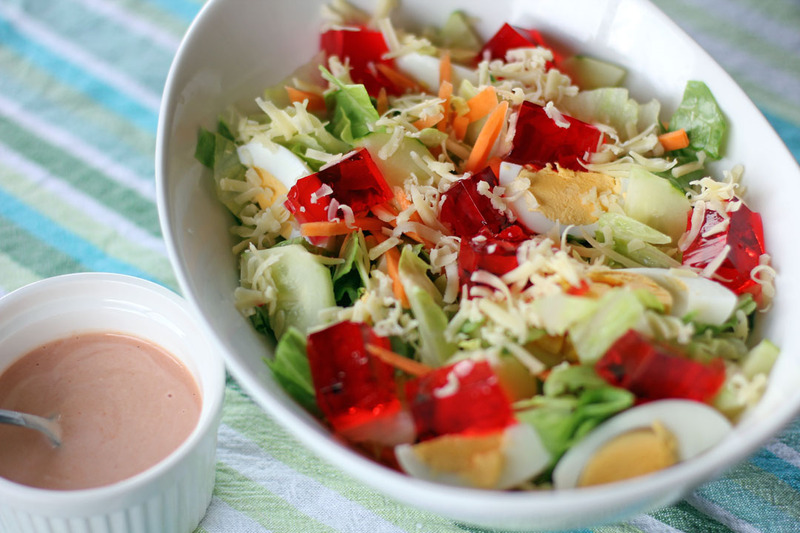 During my early College days back in the Philippines this salad in Wendy’s was a craze why? Because it was eat all you can, it was reasonably priced at the same time it was healthy and delicious. Well it’s not really 100% eat all you can, basically like any salad bar it is more like place in your plate all you can in one pass. I remember during its early years the plate offered by Wendy’s was quite bigger compared to the last time I saw it during the early 2000’s, as people become expert in stacking the salad the plates go smaller as well. I still remember my friends telling me to place the heavy ingredients on the bottom like potatoes, pineapples and macaroni and leaving the lighter ones on top, I was never good in stacking them but I do see people make 1 foot high or higher stacked salad. I also remember in Hong Kong there was even a competition in Pizza Hut in if it reaches a certain height without falling over then it’s yours for free. This was a very affordable meal for college students who wants to save money as it can be shared with everyone, all you need is an expert in stacking this and all of your mates will be full. So how about you, have you tried something like this? If you do are you good in stacking them? Toss everything in a bowl except for the Dressing. Serve with Thousand Island dressing. 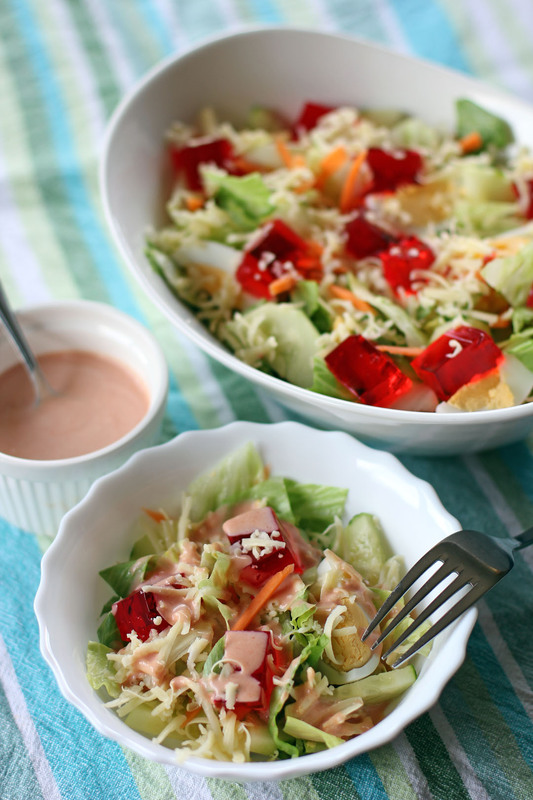 jelly on salad, i guess both me and my little niece will lovin it!!! I was actually going to a salad bar today for lunch! Hahaha. I am so much like you. I get crazy when it is “eat all you can. ” I only ate at Wendy’s twice when I was in the Philippines because I was a poor student then. Now, I am still poor but we can eat at Wendy’s because it is only 2 minutes drive from my house. I wish Wendy’s in the US still had their salad bars. Actually I was horrible at salad bars. Never learned to stack. Jello? Really? 🙂 Fun post Raymund! This actually reminds me of all you can eat Pizza Hut. You could also mix sweet with salad if you liked. haha I love the strategy !